1 de enero 1883. La Noche. Estoy muy triste yo. No sé qué vaga melancolía, indefinida soledad ahoga el alma, semejante a la profunda tristeza de las ciudades después de un tumultuoso júbilo, a una ciudad después de una felicísima unión. Soñé que imitando yo a un actor en una escena en que muere, sentí vivamente que me faltaba el aliento y perdía rápidamente las fuerzas. Después se me oscurecía la vista y densas tinieblas, como las de la nada, se apoderaban de mí: las angustias de la muerte. Quise gritar y pedir socorro a Antonio Paterno, sintiendo que iba a morir. Desperté sin fuerzas y sin aliento. The paragraph above was from Jose Rizal’s journal entry for January 1, 1883, exactly 13 years before his execution. Did Rizal really write this entry? Did he really have that dream? Based on this journal entry, it seems that Rizal knew that he was going to die. “Austin Coates is even surprised that many incidents Rizal wrote about in his novels Noli Me Tangere and El Filibusterismo eventually happened to him in real life.” (28) It’s incredible to think that Rizal had these dreams or premonitions—this is a side of Rizal that not a lot of people know. This was not the first time Rizal mentioned this dream—in fact, when Rizal was in Brussels, Belgium, he wrote a letter to Marcelo H. del Pilar dated June 11, 1890 about his plans and the use of the pseudonym Laong Laan. It is normal to be skeptical of Rizal’s paranormal experiences. But how does one explain the dream he had in December 30th? Was it a coincidence? Or was it because he was psychic? Image by Bayanihan News. 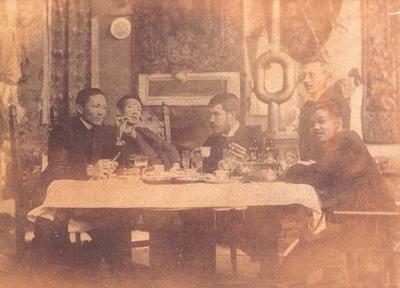 Rare Photos of Dr. Jose Rizal. This is Part 2 of a 9-Part Rizal series of Ambeth Ocampo’s Rizal Without the Overcoat.